Monday Night Combat. Evokes a sense of battle-as-primetime sport, right? Sure, thanks to a certain football broadcast. Uber Entertainment filed and owns the Monday Night Combat trademark, but it had backup plans in case the lawyer-mans raised a fuss. "We got it trademarked and no one complained, but it was definitely a concern," Chandana Ekanayake, Uber executive producer and the art director on Monday Night Combat, told Kotaku on Tuesday. "We had some alternate plans for it, too. But we have the trademarks on everything." Second-string names included "Battle, Inc." "Combat, Inc." and "Friday Night Frag Fest." I prefer the first two to the extremely campy last one, but none are as good as "Monday Night Combat," of course. Monday Night Combat ain't like a country music song, where they write the title first and fill in the rest later. The Uber Entertainment crowd thought hard about the kind of game it wanted to make, drawing on some RTS elements of Supreme Commander and Demigod, which Uber CEO Bob Berry and creative director John Comes had worked on at Gas Powered Games. The team built a fiction supporting the zany high-tech battle for cash, which involved a futuristic gameshow/sports event. Then they needed a handle for it all. "We wanted to convey that it's a scheduled event, scheduled combat if you will," Ekanayake said. 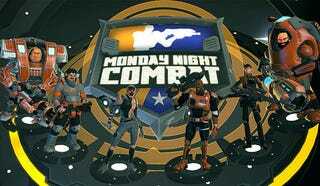 "Monday Night Combat just conveyed that idea really well. It's a prime-time event, playing off those wrestling and football tropes." Ekanayake said another name was a very strong contender but he wouldn't reveal it, as it might be useful to Uber Entertainment down the line. Asked if that was DLC-related (Uber has a free extension coming out soon), he wouldn't budge. But Uber figures the successful trademark filing is proof Monday Night Football's folks are cool with it. "I'm sure there are a thousand lawyers at Disney [which owns ESPN] whose job is to look for trademark infringements," Ekanayake said.